Willem de Kooning (April 24, 1904 - March 19, 1997) was a Dutch American abstract expressionist artist who was born in Rotterdam, the Netherlands. 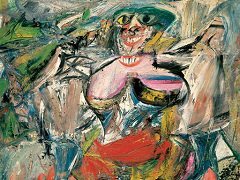 In the post-World War II era, de Kooning painted in a style that came to be referred to as Abstract expressionism or Action painting, and was part of a group of artists that came to be known as the New York School. Other painters in this group included Jackson Pollock, Lee Krasner, Franz Kline, Arshile Gorky, Mark Rothko, Hans Hofmann, Jasper Johns, Anne Ryan, Robert Motherwell, Philip Guston, and Clyfford Still. In September 2011 de Kooning's work was honored with a large-scale retrospective exhibition: de Kooning: A Retrospective September 18, 2011 - January 9, 2012 at MoMA in New York City. 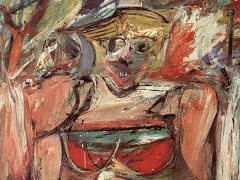 Organized by John Elderfield it was the first major museum exhibition devoted to the full breadth and depth of de Kooning's career, containing nearly 200 works. 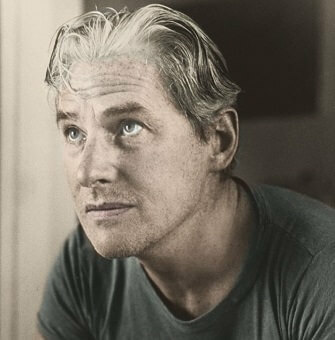 Willem de Kooning was born April 24, 1904 in the working class district of Rotterdam Noord (North Rotterdam) to parents Leendert de Kooning and Cornelia Nobel. 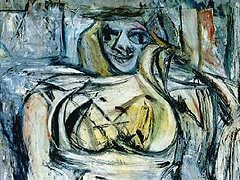 His parents divorced on January 7, 1907 and de Kooning lived with his mother. His early artistic training included eight years at the Rotterdam Academy of Fine Arts and Techniques. In the 1920s he worked as an assistant to the art director of a Rotterdam department store. He moved to the USA as a stowaway in 1926 aboard the British freighter SS Shelley. De Kooning was one of the thirty-eight artists chosen from a general invitation to New York City metropolitan artists to design and paint the 105 public murals at the 1939 New York World's Fair. His fellow muralist, David Margolis later recounted their 1932 trips to the Savoy Ballroom and de Kooning's "keen interest in jazz." 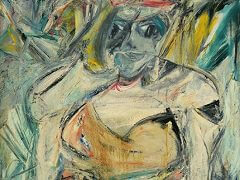 In 1938, de Kooning met Elaine Marie Fried, later known as Elaine de Kooning, whom he married in 1943. She also became a significant artist. During the 1940s, he became increasingly identified with the Abstract Expressionist movement and was recognized as one of its leaders into the mid-1950s, while notoriously stating: "It is disastrous to name ourselves." In 1948, de Kooning had his first one-man show, which consisted of his black-and-white enamel compositions, at the Charles Egan Gallery in New York. 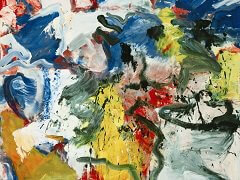 He taught at Black Mountain College in North Carolina in 1948 and at the Yale School of Art in 1950/51. In 1950, de Kooning was one of 17 prominent Abstract Expressionists and avant-garde artists to sign an open letter to the New York Metropolitan Museum of Art accusing it of hostility towards "advanced art." In 1959, de Kooning bought five acres of land off Springs' Fireplace Road in East Hampton from the photographer and sculptor Wilfrid Zogbaum and began construction on what was then considered the largest artist's studio built in the Hamptons. In 1946, too poor to buy artists' pigments, he turned to black and white household enamels to paint a series of large abstractions; of these works, Light in August (c. 1946) and Black Friday (1948) are essentially black with white elements, whereas Zurich (1947) and Mailbox (1947/48) are white with black. Developing out of these works in the period after his first show were complex, agitated abstractions such as Asheville (1948/49), Attic (1949), and Excavation (1950; Art Institute of Chicago), which reintroduced color and seem to sum up with taut decisiveness the problems of free-associative composition he had struggled with for many years. 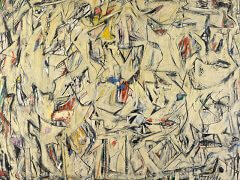 The hallmark of de Kooning's style was an emphasis on complex figure ground ambiguity. Background figures would overlap other figures causing them to appear in the foreground, which in turn might be overlapped by dripping lines of paint thus positioning the area into the background. During this period he also created other paintings of women. These works were shown at the Sidney Janis Gallery in 1953 and caused a sensation, partially because they were figurative when most of his fellow Abstract Expressionists were painting abstractly, but also because of their blatant imagery. Aggressive brushwork and strategically placed high-key colors in these paintings merged with images of toothy snarls, overripe, pendulous breasts, enlarged eyes and blasted extremities to reveal a woman seemingly congruent with some of modern man's most widely held sexual fears. Some of these paintings also appeared to reference early Mesopotamian / Akkadian works, with the large eyes and squarely chiseled bodies. The Woman paintings II through VI (1952-53) are all variants on this theme, as are Woman and Bicycle (1953; Whitney Museum of American Art, New York) and Two Women in the Country (1954). The deliberate vulgarity of these paintings contrast with the French painter Jean Dubuffet's Corps de Dame series of 1950, in which iconic female/goddess imagery was created with a topography of earth colours, and are generally perceived as less provocative. In 1963, De Kooning moved permanently to East Hampton, Long Island, and returned to depicting women while also referencing the landscape in such paintings as Woman, Sag harbor and Clam Diggers. In June 1968 Willem went to Rome on holiday and ran into an old friend Herzl Emanuel while staying with Emmanuel he excitedly began to produce a series of thirteen small clay sculptures in the s tyle of his women series of paintings. After returning to the US he commissioned David Christian to enlarge and cast them in bronze. 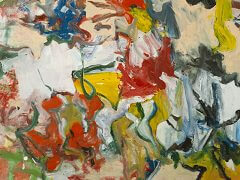 De Kooning was highly prolific during the 1980s, painting more than 300 canvases. During his later years, his health began to fail; by 1987 he began showing signs of dementia and was diagnosed with the probability of suffering from Alzheimer's disease. After his wife Elaine died on February 1, 1989, his daughter, Lisa (Johanna Liesbeth de Kooning 1956-2012), and his lawyers, Lee and John Eastman were granted guardianship over De Kooning. There is much debate over the significance of his 1980s paintings, which became clean, sparse, and almost graphic, while alluding to the biomorphic lines of his early works. Some have said that his very last works present a new direction of compositional complexity and color juxtaposition, and are prophetic of directions that some current painters continue to pursue. Some speculate that his mental condition and years of alcoholism had rendered him unable to carry out the mastery indicated in his early works. 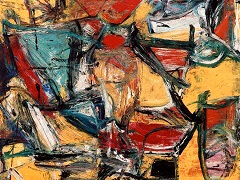 Others claim some of these paintings were removed from the studio and exhibited before de Kooning was finished with them. Unfortunately, de Kooning's last works have not been afforded the amount of critical commentary or substantial serious assessment that his earlier works received.